Good news to students in campus! Airtel has finally added more bonuAirtel Added Campus 30% Data Bonus to Their Smartrybe 2.0 Tariff Plans to your subscription plan through the smart TRYBE tariff plan. This means that you will always get 30% data bonus offer on any data purchased of N500 and above made in any campus in Nigeria. The offer has been advertised on social media, televisions and on many platforms on the internet. Meanwhile, not everybody will really like the offer because it can only be made and used in the campus and that simply means, everyone won't be able to use it. 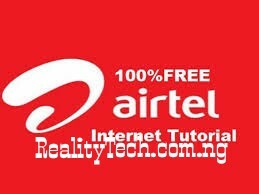 Airtel already have special benefits in the smart TRYBE 2.0 tariff plan which are: Calling at 11kb/sec, 500MB for 1GB data valid for 7 days, night browsing of 25naira for 500MB that valid from 12am to 5am in the morning and the newly added offer of 30% data bundle on any data purchased from N500 and above for only the students in the campus. 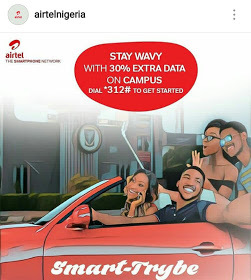 To activate the Airtel 30% data bundle, simply dial *312# and choose 1 to migrate and after successful migration, you can now recharge and buy data bundle of 500naira and above in your campus and it will automatically be doubled to 30 percent of the data purchased.